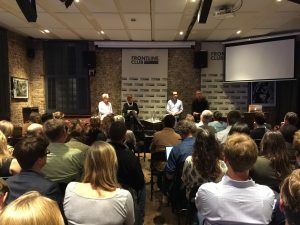 A capacity audience at London’s famed Frontline Club was last night (October 24) taken behind the scenes of the major undercover investigation which earlier this year blew the lid off the global hub of illegal ivory trade. Over a three-year period, EIA investigators patiently gathered evidence and successfully infiltrated a smuggling syndicate operating out of the obscure Chinese town of Shuidong – claimed by one of the senior wildlife criminals involved as the destination for up to 80 per cent of all poached ivory shipped from Africa to China. Until EIA published its report The Shuidong Connection in July, the town was completely off the radar of any authorities, even those in China, despite being home to a number of trafficking syndicates. One of these was said to have handled 20 shipments of illegal ivory in a single year. Last night’s Frontline Club event, Tusk Traffickers – Inside the illegal ivory trade, was hosted by Dr Sam Geall, executive editor of China Dialogue and an associate fellow at Chatham House, who moderated a panel discussion and Q&A on the connections between corruption, criminality and the illegal ivory trade. Joining EIA speakers Executive Director Mary Rice and Campaigns Director Julian Newman was Deborah Davies, part of the award winning Al Jazeera Investigative Unit. The audience of journalists, media professionals and others heard details of the investigations in China, Mozambique and Tanzania before being given an update on the responses to date from the Chinese Government and actions taken. And in a specially prepared film, EIA’s chief undercover investigator – his identity obscured for security and personal safety – talked them through the high points of the Shuidong operation and the risks of working undercover to expose illegal wildlife trade. Receive updates about our work straight to your inbox. ©2019 Environmental Investigation Agency Trust Ltd.